The building is shaking! A water inside the glass is making a wave! I couldn't stand straight! I feel dizzy! The coconut trees are terribly shaking! These are the traumatic reactions of the pupils and teachers of Cubay Elementary School when intensity 6.8 earthquake hits La Carlota at 11:49 a.m. before noon today. The school principal while he was inside his office noticed that the couch while he was sitting was moving to and fro. He overheard from the outside the howls and shouts of the pupils. He rushed outside to check and realizing later that there was an earthquake. A score of pupils covering their heads were led by their teachers to gather in an open space to settle down and wait for the quake to stop. Some proceeded directly to the nearby sugarcane field just across the gate of the school. All teachers were in alert. They supervised every pupil to follow the instructions as relayed by their school principal. 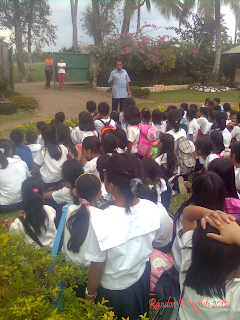 While the children were waiting for their parents, guardians to fetch them home, they're carefully instructed by their school principal and reminded them in what to do just what they're doing in their earthquake drill before. A grade 6 boy relayed his traumatic experience. He couldn't believe seeing the coconut trees in a nearby place terribly swaying to and fro where in fact there is no strong wind or typhoon. An H.E. teacher told that she saw how the building which housed the principal office and Learning Resource Center shook for several seconds. The teacher was nervous while relating her tale to the school principal. Another Grade 3 girl said that while having her lunch, leaning in a trunk of a tree, she was surprised to find out that the trunk was moving and finally shaking. She was shocked and afraid. The principal has his own tale to share too. While standing on the ground just outside his office, he complained why he couldn't stand erect and he felt dizzy. His teachers shared same situations. The schools division superintendent immediately issued unnumbered memo declaring the suspension of classes due to the earthquake until Wednesday to give time the city to inspect the building of the school whether it is safe to occupy after the earthquake. This is the first time in the history of La Carlota where the city is hit by intensity 6.8 quake. I Scarcely Perceptible - Perceptible to people under favorable circumstances. Delicately balanced objects are disturbed slightly. Still Water in containers oscillates slowly. II Slightly Felt - Felt by few individuals at rest indoors. Hanging objects swing slightly. Still Water in containers oscillates noticeably. III Weak - Felt by many people indoors especially in upper floors of buildings. Vibration is felt like one passing of a light truck. Dizziness and nausea are experienced by some people. Hanging objects swing moderately. Still water in containers oscillates moderately. IV Moderately Strong - Felt generally by people indoors and by some people outdoors. Light sleepers are awakened. Vibration is felt like a passing of heavy truck. Hanging objects swing considerably. Dinner, plates, glasses, windows and doors rattle. Floors and walls of wood framed buildings creak. Standing motor cars may rock slightly. Liquids in containers are slightly disturbed. Water in containers oscillate strongly. Rumbling sound may sometimes be heard. V Strong - Generally felt by most people indoors and outdoors. Many sleeping people are awakened. Some are frightened, some run outdoors. Strong shaking and rocking felt throughout building. Hanging objects swing violently. Dining utensils clatter and clink; some are broken. Small, light and unstable objects may fall or overturn. Liquids spill from filled open containers. Standing vehicles rock noticeably. Shaking of leaves and twigs of trees are noticeable. VI Very Strong - Many people are frightened; many run outdoors. Some people lose their balance. motorists feel like driving in flat tires. Heavy objects or furniture move or may be shifted. Small church bells may ring. Wall plaster may crack. Very old or poorly built houses and man-made structures are slightly damaged though well-built structures are not affected. Limited rockfalls and rolling boulders occur in hilly to mountainous areas and escarpments. Trees are noticeably shaken. VII Destructive - Most people are frightened and run outdoors. People find it difficult to stand in upper floors. Heavy objects and furniture overturn or topple. Big church bells may ring. Old or poorly-built structures suffer considerably damage. Some well-built structures are slightly damaged. Some cracks may appear on dikes, fish ponds, road surface, or concrete hollow block walls. Limited liquefaction, lateral spreading and landslides are observed. Trees are shaken strongly. (Liquefaction is a process by which loose saturated sand lose strength during an earthquake and behave like liquid). VIII Very Destructive - People panicky. People find it difficult to stand even outdoors. Many well-built buildings are considerably damaged. Concrete dikes and foundation of bridges are destroyed by ground settling or toppling. Railway tracks are bent or broken. Tombstones may be displaced, twisted or overturned. Utility posts, towers and monuments mat tilt or topple. Water and sewer pipes may be bent, twisted or broken. Liquefaction and lateral spreading cause man- made structure to sink, tilt or topple. Numerous landslides and rockfalls occur in mountainous and hilly areas. Boulders are thrown out from their positions particularly near the epicenter. Fissures and faults rapture may be observed. Trees are violently shaken. Water splash or stop over dikes or banks of rivers. IX Devastating - People are forcibly thrown to ground. Many cry and shake with fear. Most buildings are totally damaged. bridges and elevated concrete structures are toppled or destroyed. Numerous utility posts, towers and monument are tilted, toppled or broken. Water sewer pipes are bent, twisted or broken. Landslides and liquefaction with lateral spreadings and sandboils are widespread. the ground is distorted into undulations. Trees are shaken very violently with some toppled or broken. Boulders are commonly thrown out. River water splashes violently on slops over dikes and banks. X Completely Devastating - Practically all man-made structures are destroyed. Massive landslides and liquefaction, large scale subsidence and uplifting of land forms and many ground fissures are observed. Changes in river courses and destructive seiches in large lakes occur. Many trees are toppled, broken and uprooted. I was at work the whole day and no one texted me about this. I just learned it when I got home and went online. Saw the photos of devastation in Negros Oriental...really sobering. It's a relief that there seems to be no damage of such scale in our province. But let's pray for everyone, especially for the people of Negros Oriental who are just recovering from typhoon Sendong. Thank God you and your family are ok.
My wife keeps on praying. She was joined with her grandchildren ranging from 5, 7 and 8. As of this writing, I'm still in processing of adjusting myself. 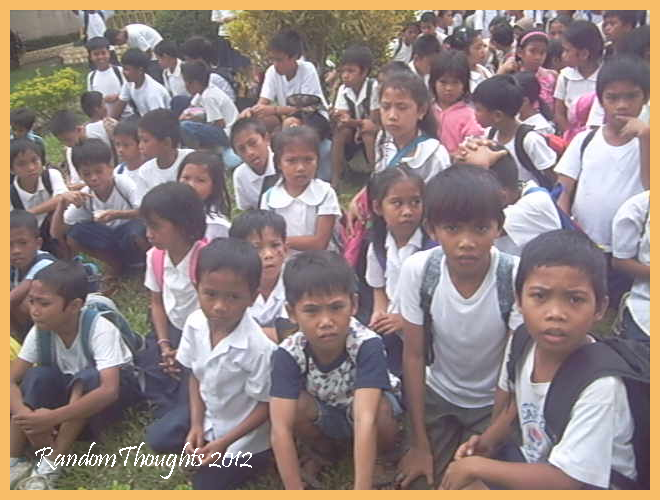 I was terribly affected upon seeing and hearing our pupils howling and shouting! They couldn't believe such strong tremor in a broad daylight. i have watched bad news and feel sad to know what's happening there... really sad... Let's pray for all the people all over Visayas. Thanks God that you and your family are safe. Take care always Sie Gil. We do pray for everyone's safety. Thanks @myrnz for your concern too. that's a traumatic experienced to students.I too still remember an earthquake while in school building during my college days .this was when the hotel in Baguio collapsed ,I think it was year 1990 .I was at the 2nd floor of the dentistry building.I hope that the school did not get any damaged from the earthquake. great info. hope everybody at ur place is okay. my lola got hospital from being too nervous in bacolod. hope all of us will be safe.